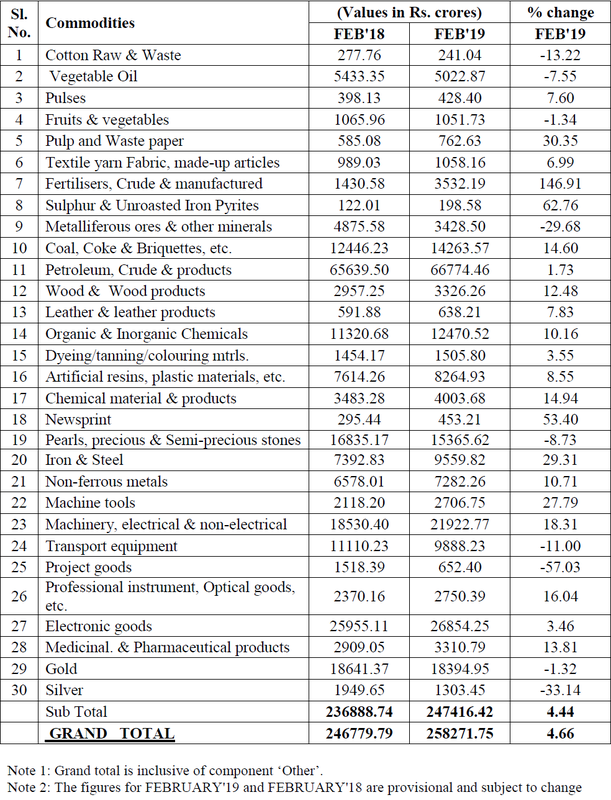 Mar 15, 2019: The data on foreign trade of India for the month of February-2019 as released by the Ministry of Commerce & Industry, Department of Commerce, Economic Division, is presented hereunder. India’s overall exports (Merchandise and Services combined) in April-February 2018-19* are estimated to be USD 483.98 Billion, exhibiting a positive growth of 8.73 per cent over the same period last year. Overall imports in April-February 2018-19* are estimated to be USD 577.31 Billion, exhibiting a positive growth of 9.42 per cent over the same period last year. Exports in February 2019 were US $ 26.67 Billion, as compared to US $ 26.03 Billion in February 2018, exhibiting a positive growth of 2.44 per cent. 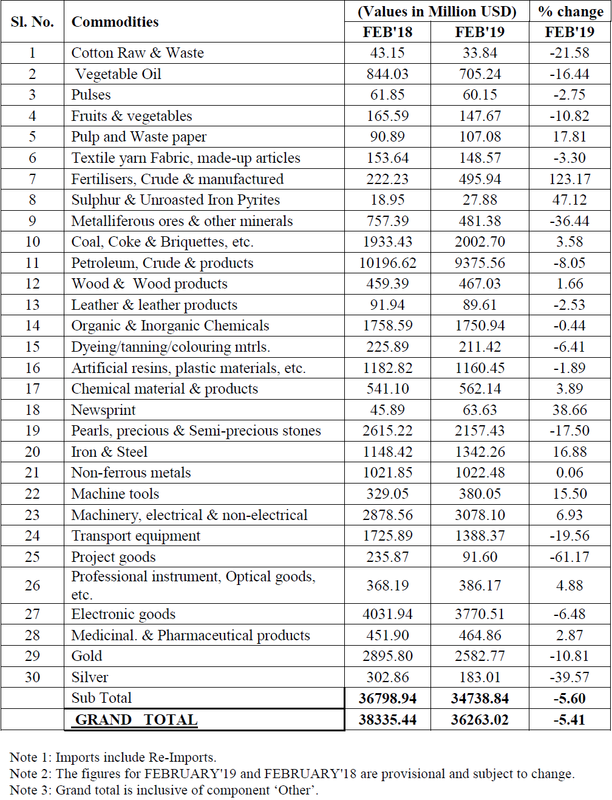 In Rupee terms, exports were Rs. 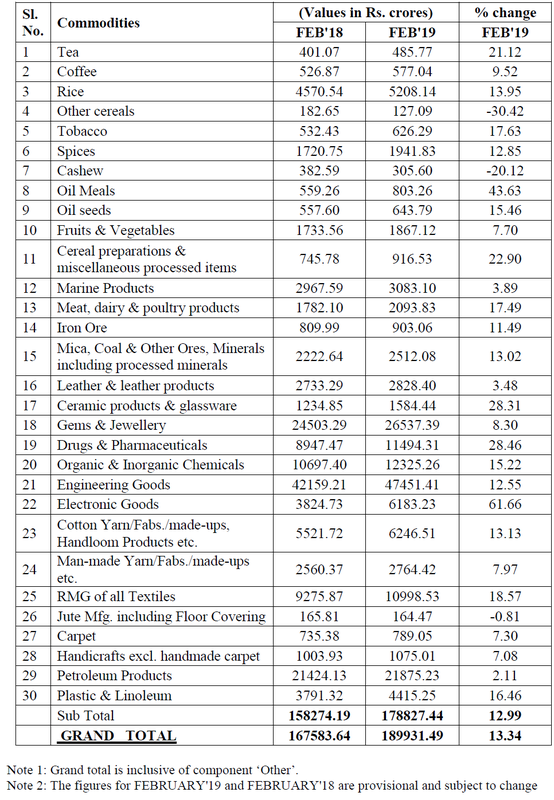 1,89,931.49 Crore in February 2019, as compared to Rs. 1,67,583.64 Crore in February 2018, registering a positive growth of 13.34 per cent. Cumulative value of exports for the period April-February 2018-19 was US $ 298.47 Billion (Rs. 20,88,290.32 Crore) as against US $ 274.21 Billion (Rs. 17,65,895.27 Crore) during the period April-February 2017-18, registering a positive growth of 8.85 per cent in Dollar terms (18.26 per cent in Rupee terms). Non-petroleum and Non Gems and Jewellery exports in February 2019 were US $ 19.87 Billion, as compared to US $ 18.90 Billion in February 2018, exhibiting a positive growth of 5.14 per cent. Non-petroleum and Non Gems and Jewellery exports in April-February 2018- 19 were US $ 217.43 Billion, as compared to US $ 201.95 Billion for the corresponding period in 2017-18, an increase of 7.66 per cent. Imports in February 2019 were US $ 36.26 Billion (Rs. 2,58,271.75 Crore), which was 5.41 per cent lower in Dollar terms and 4.66 per cent higher in Rupee terms over imports of US $ 38.34 Billion (Rs. 2,46,779.79 Crore) in February 2018. Cumulative value of imports for the period April-February 2018-19 was US $ 464.00 Billion (Rs. 32,46,190.43 Crore), as against US $ 422.76 Billion (Rs. 27,22,592.19 Crore) during the period April-February 2017-18, registering a positive growth of 9.75 per cent in Dollar terms (19.23 per cent in Rupee terms). Oil imports in February 2019 were US $ 9.38 Billion (Rs. 66,774.46 Crore), which was 8.05 percent lower in Dollar terms (1.73 percent higher in Rupee terms), compared to US $ 10.20 Billion (Rs. 65,639.50 Crore) in February 2018. Oil imports in April-February 2018-19 were US $ 128.72 Billion (Rs. 9,01,538.30 Crore) which was 31.98 per cent higher in Dollar terms (43.57 percent higher in Rupee terms) compared to US $ 97.53 Billion (Rs. 6,27,961.37 Crore), over the same period last year. Non-oil imports in February 2019 were estimated at US $ 26.89 Billion (Rs. 1,91,497.29 Crore) which was 4.45 per cent lower in Dollar terms (5.72 percent higher in Rupee terms), compared to US $ 28.14 Billion (Rs. 1,81,140.29 Crore) in February 2018. Non-oil imports in April-February 2018-19 were US $ 335.28 Billion (Rs. 23,44,652.13 Crore) which was 3.09 per cent higher in Dollar terms (11.94 percent higher in Rupee terms), compared to US $ 325.23 Billion (Rs. 20,94,630.82 Crore) in April-February 2017-18. Non-Oil and Non-Gold imports were US $ 24.30 billion in February 2019, recording a negative growth of 3.72 per cent, as compared to Non-Oil and Non-Gold imports in February 2018. 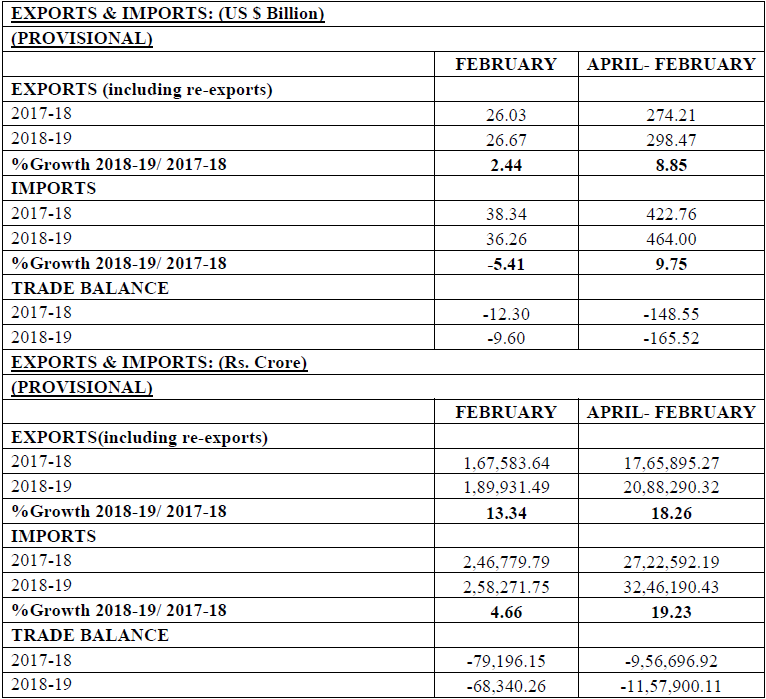 Non-Oil and Non-Gold imports were US $ 305.73 billion in April-February 2018-19, recording a positive growth of 3.97 per cent, as compared to Non-Oil and Non-Gold imports in April-February 2017-18. Exports in January 2019 were US $ 17.75 Billion (Rs. 1,25,515.53 Crore) registering a negative growth of 1.02 per cent in dollar terms, vis-à-vis December 2018. (as per RBI’s Press Release for the respective months). Imports in January 2019 were US $ 11.03 Billion (Rs. 77,997.17 Crore) registering a negative growth of 3.07 per cent in dollar terms, vis-à-vis December 2018. (as per RBI’s Press Release for the respective months). The trade deficit for February 2019 was estimated at US $ 9.60 Billion as against the deficit of US $ 12.30 Billion in February 2018. 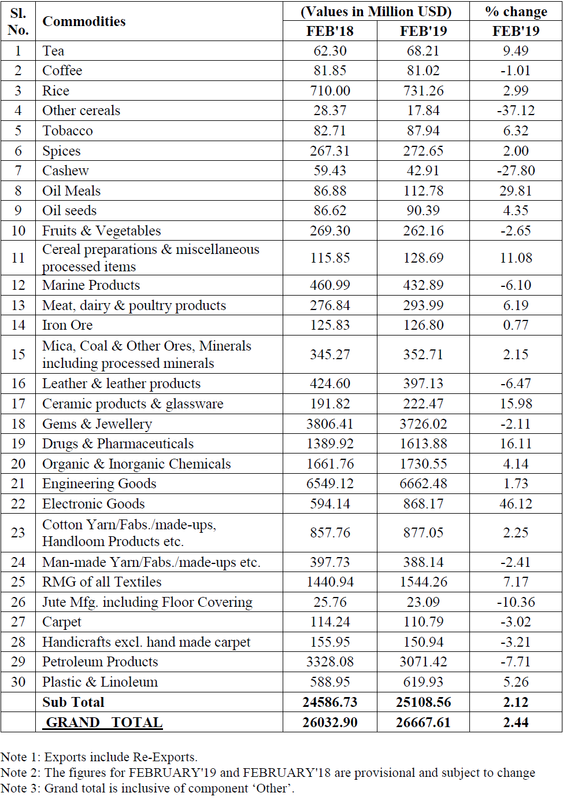 As per RBI’s Press Release dated 15th March 2019, the trade balance in Services (i.e. Net Services export) for January, 2019 is estimated at US $ 6.72 Billion. 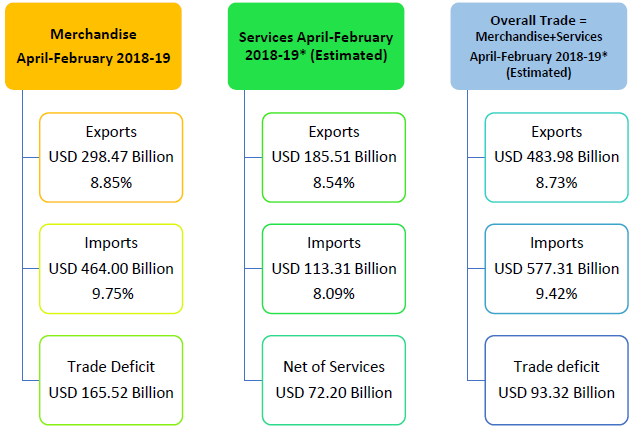 Taking merchandise and services together, overall trade deficit for April-February 2018-19* is estimated at US $ 93.32 Billion as compared to US $ 82.46 Billion in April-February 2017-18.